With training camp 10 days away, the Seattle safety took to social media to ask the team to trade him if he doesn't soon have a new contract. 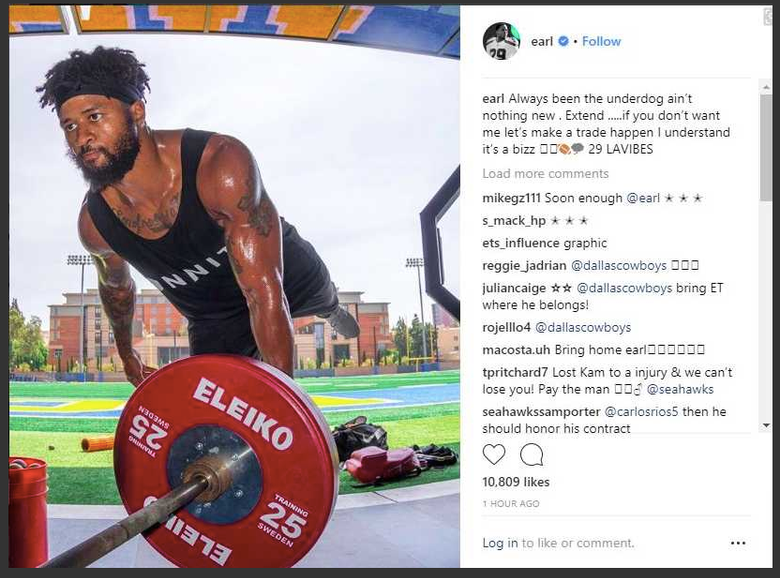 The big question as the Seahawks get set to open training camp July 26 is whether veteran three-time All-Pro free safety Earl Thomas will show up, after having skipped minicamp in June to loudly let the team know that he’d like a new contract. In an apparent sign that there has been no thawing in the positions of either camp, Thomas took to Instagram on Monday afternoon to post a brief note asking the Seahawks to trade him if they can’t get a deal done. Thomas hasn’t said much since releasing a statement before minicamp in June to say he would not take part in any team activities until his contract situation was resolved. Could Thomas’ minicamp holdout, followed shortly thereafter by Kam Chancellor’s announcement that he has not been cleared to play football, lead to renewed talks between Thomas and the Seahawks? It appears the Seahawks are not budging and Thomas’ brief statement Monday indicates he might be laying the groundwork to continue his holdout into training camp. The stakes get higher, though. Thomas could be fined $40,000 for each day of training camp he misses. If the holdout lasts beyond five days, teams can also fine a player 15 percent of his signing bonus (which was $9.5 million for Thomas), and 1 percent for each additional day, up to 25 percent. (Though, teams can fine players, but do not have to, and fines are often reduced or waived once a player reports.) During the regular season, players are paid weekly and Thomas would get docked one-seventeenth of his base salary of $8.5 million for every game he missed, or $500,000. Thomas has to report by midseason or his contract could be tolled, meaning he couldn’t become a free agent at the end of the 2018 season. Thus, he has plenty of incentive to report at some point, and he also would like something settled before camp starts so he doesn’t risk losing money (Thomas could also have been fined $84,435 for skipping minicamp. It’s unclear if Thomas was fined for minicamp). Thomas said he wants the team to give him a new contract that would likely top the $13 million-a-year of the highest-paid safety in the NFL, Kansas City’s Eric Berry. Thomas’ current average-per-year of $10 million ranks sixth among all safeties. But the Seahawks appear reluctant to go that route at the moment. Thomas will turn 30 before the 2019 season and Seattle has been burned on the past three third contracts it handed out, to Marshawn Lynch, Michael Bennett and Chancellor. The Seahawks showed this offseason that they are fine with moving on from veteran players now. Seattle general manager John Schneider said in April there had not been talks between the two sides since the NFL combine in March. Schneider said then there was no need for any additional talks because “they know where we are at” in terms of what the team might be willing to offer. The Seahawks also are thought comfortable with Thomas playing this season without a new contract, knowing they could potentially get a third-round compensatory draft choice in 2020 if he signs elsewhere. (Seattle also would have franchise tag options, though those are probably unlikely to come into serious consideration). Dallas is still the team many believe would be most interested in trading for Thomas, in part because Thomas has said he’d love to play for the Cowboys, the team he followed as a kid while growing up in Orange, Texas. Any team trading for Thomas would want him for more than a year and Thomas would likely be willing to do what it takes to make a contract work with the Cowboys. But it’s also thought Dallas has not offered more than a third-round choice, and Seattle apparently wants at least a second. So for now, as Thomas’ statement Monday reiterated, the stalemate continues.